Both roads were closed but have since reopened. Police said the family of the man killed had been informed, and they were appealing for information. 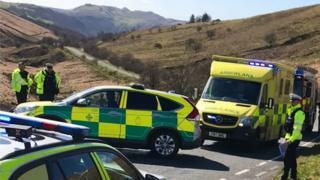 The second accident, at about 16:00 GMT near the Storey Arms outdoor centre, involved a car and two motorbikes. On Sunday, Dyfed-Powys Police launched their annual campaign to reduce the number of motorcyclists seriously hurt in the area, which has long been popular with riders.